Mr Gaunt said that after spending almost a third of his life as club patron he felt it was the right time to hand the duties to over, selecting former Perth MHR Stephen Smith to replace him. ‘He is a friend of mine through my son, they attended school and university together, as well as working for some time together as well,’ Mr Gaunt said. ‘I thought he would be the ideal person to take over from me. 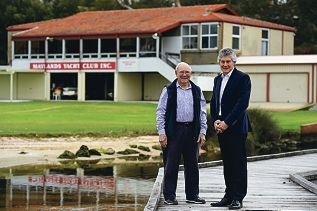 Unlike many other patrons, Mr Gaunt has been an avid sailor at the club since he was a young child. He went on to win state and national titles in a variety of classes and still sails with his daughter from the Maylands base. Mr Gaunt said that in his time as patron the small club, which boasts about 120 members, he had focused on training. ‘We have a very strong junior training scheme there and that is really because it is important to have somewhere kids can go and learn to sail in a fairly safe environment,’ he said. He said the biggest change at the club was the number of single-manned boats. ‘The boats they were sailing previously always had a couple of crew and we had more members as a result,’ he said. Mr Smith’s first job as patron will be to open the sailing season on Sunday, October 12, at 1.30pm.